The performance of the 2017 Honda Accord is nothing short of impressive, especially as it continues to live up to its reputation as a fuel-friendly sedan. Offering two engines and plenty of intelligent handling features, the Honda Accord is one of the top performers in its segment. Drivers in Los Angeles, Santa Monica, and nearby cities are sure to appreciate its focus on fuel-efficient technologies and features, as well as clever extras like remote engine start, i-VTEC, Variable Cylinder Management, and more! The Accord’s engines are imbued with i-VTEC technology, which draws more power from less fuel by adjusting air-fuel intake and exhaust valves’ opening intervals according to engine speeds. Standard on EX (with CVT) and above, this system allows you to start the engine and activate the climate system from up to 400 feet away. The CVT with Sport Mode, which is standard on EX-L V-6 and Touring, comes with steering wheel-mounted paddle shifters for quick, on-the-fly gear shifts. Standard on Touring, Lane Keeping Assist detects lane drifting and provides visual and tactile alerts, and can even apply steering torque to get your vehicle back on course. The 2017 Honda Accord is offered with a 185- to 189-hp 2.4L inline-4 engine and a 278-hp 3.5L V6 engine. In addition to i-VTEC, all engines feature an Eco Assist System, an aluminum-alloy engine block and cylinder head, and Direct Injection. The EX-L V-6 and Touring trims’ V6 engine includes Variable Cylinder Management, which allows it to switch between four and six cylinders for greater efficiency. There’s no such thing as a gas-guzzling Honda Accord; however, the models furnished with the 185-hp 2.4L engine and optional CVT achieve the highest fuel economy of the bunch: an EPA-estimated 27 mpg city/36 mpg highway* rating. Behind the wheel of the new Honda Accord Sedan, you’ll experience light, effortless steering and composed handling, thanks to several carefully engineered systems. 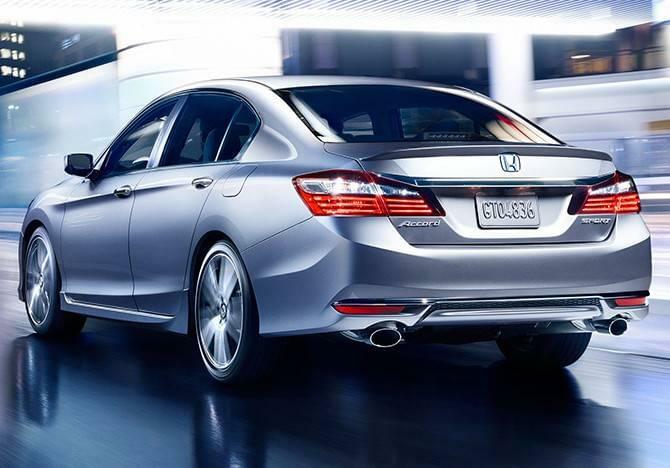 MacPherson strut front/multi-link rear suspension systems enhance the Accord’s stability and fluidity as it weaves through Los Angeles streets or sails down Inglewood roads. On rockier terrain, the front and rear stabilizer bars offer added rigidity, as do the front shock tower bar and all-season tires. Vehicle Stability Assist with Traction Control helps to keep the Accord’s wheels planted firmly on the road as it rounds corners and conquers slippery surfaces. Contact Airport Marina Honda to experience the 2017 Honda Accord’s performance first-hand! Our team will help you book a test drive, choose your ideal Accord, and find a workable financing solution!